Trumpeter Henry Grainger, aged thirty years, was admitted into hospital on 27th February, 1851; he was seen at the morning visit, at 10 o’clock, by the assistant surgeon, Dr George, who found him in bed, and considered that his ideas were somewhat confused, but attributed this, in part, to indulgence in drink the previous night (the 26th), as, on questioning the patient as to what was the matter with him, he said that on the previous evening he had been fencing with a walking cane with some of his companions and that he had received a blow on the nose, or a thrust from a cane in the face. For who has not had a drunken fencing match with a walking cane? On examination, a small punctured wound was observed on the left ala of the nose, which did not appear larger than the wound arising from a leech-bite; and at this time, though somewhat taciturn, he appeared perfectly sensible, and answered readily the questions put to him. The ala is the side of the nose. The doctor assumed that the wound itself was trivial, and that the soldier’s principal ailment was a stinking hangover. Fomentations to the wounded part, and aperient medicines, were the remedies prescribed, and no unfavourable symptoms supervened during that day. At the morning visit on the 28th, he was considered as not better, nor as sensibly worse, though there was no doubt that he was at this time labouring under a considerable degree of stupor; yet no alarming head symptoms were manifest, and, consequently, no particular examination of the parts where the wound existed was made, and the only additional remedy prescribed was a cold lead lotion to the head and face, and the purgative medicine was repeated. As so often in nineteenth-century medicine, ‘aperient’ (laxative) medicines were the first line of defence. But in this particular case they were woefully inadequate to the task at hand. A few hours later the doctor was summoned by the hospital sergeant, who told him that the patient was much worse. When I ﬁrst saw him this afternoon he was struggling violently with the attendants, who required to use force to keep him in bed; his breathing was stertorous, and he was pufﬁng with the lips; the right eye was fully expanded or staring, and its pupil greatly contracted; ptosis of the left eye-lid existed, and on raising the eyelid the pupil was found to be extremely dilated. He had passed a large quantity of urine in bed, and his bowels had been open since morning. When breathing is ‘stertorous’ it is laboured; ‘ptosis’ is a drooping of the upper eyelid. The condition of the pupils (one fully dilated, the other contracted) was worrying: a possible sign of brain injury. On questioning him, or rather calling him sharply by name he would raise himself into the sitting posture, throw his arms about, and strike at, or take ﬁrm hold of any object within his reach. I had considerable doubt and difficulty in determining on the immediate measures to be adopted, the history of the case being to me quite obscure, and the symptoms being urgent and most unfavourable. A large turpentine enema was then administered, and grain doses of calomel were ordered every hour or half-hour. Turpentine (an oil extracted from tree resin by distillation) was once used to treat intestinal parasites. It is not clear what the doctor hoped to achieve with it in this case. I left the hospital with very slender hopes that a fatal issue could be averted, and I had not been much more than half an hour in my room when I was called to the hospital, but before I reached it the patient had expired, after a violent convulsion attended with great discolouration of the countenance. The fatal event occurred at about a quarter past 8 o’clock on the evening of the 28th of February, 1851; and the features of the deceased appeared calm, and not distorted, when I saw the body. We had got as far as the division of the optic nerves, when the scalpel struck suddenly on a metallic point or substance directed obliquely upwards and backwards, and protruding into the cavity of the skull, close to the left side of the sella turcica of the sphenoid bone, and pressing or lying on the left optic nerve, or left side of the optic commissure. The sphenoid is a bone in the base of the skull, forming part of the eye sockets. The sella turcica is a depression in this bone which houses the pituitary gland. The cause of the man’s death was at once made manifest to myself and Drs Carte and George, who were present at the examination, as the foreign body was evidently the brass point or ferule of a small walking-cane. Since it was now clear that the man had not died from natural causes, the doctor halted the autopsy and notified his commanding officer so that the a criminal investigation could be undertaken. A coroner appointed another surgeon, Mr Porter, to examine the brain further, but Dr Anderson remained present as he did so. On probing the nostril the end of a foreign body could be detected, and before it was removed by Mr Porter from the situation it occupied in the skull, it was evident to all present at the examination that it was the broken end of a cane, of which the ferule or brass point presented itself in the inside of the skull, by the side of the posterior clinoid process of the sphenoid bone. Dr Carte afterwards made a section of the skull, by which the course of the stick, as is shown in the wood-cut, was exhibited. The point of the cane had pierced the left side of the nose, where the cartilage meets the bone. It had then passed upwards, backwards and a little inwards, grazing the bony lining of the nasal passage as it did so. The brass ferrule had broken off part of the sphenoid bone before coming to rest against the membranes covering the left lobe of the brain next to the optic nerve. Somehow it had stopped just short of penetrating into the brain matter. 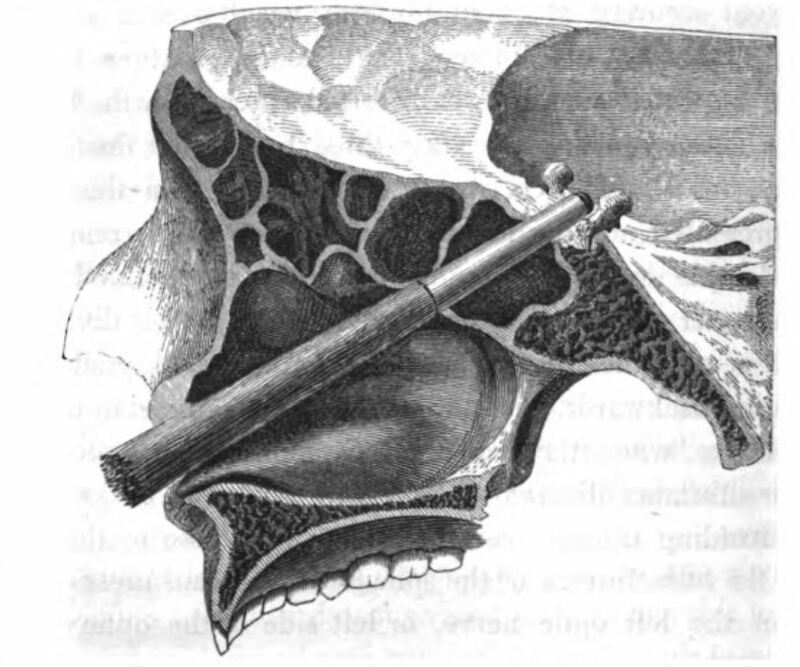 Anatomically speaking, there was nothing to oppose the onward progress of the stick, for in fact it passed up the nostril, the only resisting part, after it entered the skin and cartilage, being the body of the sphenoid itself, which, in the present instance, was very slight, its walls affording almost no resistance, in consequence of their extreme thinness. It is evident that, while fencing as he had described, the cane had accidentally struck the unfortunate man’s face, probably from his own act in parrying the thrust, and that the point of it had entered through the left ala of the nose, passing obliquely upwards and backwards, until it emerged, as described above, by the side of the sella turcica. I should think that the cane had broken off short in the nose when it was being withdrawn by his assailant. I am inclined, however, to the opinion, that had all the above information been obtained at the time of the unfortunate soldier’s admission into hospital, the foreign body might not have been extracted from the situation it occupied in the man’s skull, as it required considerable force to drive it with a punch and hammer, from within outwards, in the dead body; and if it had been extracted, the question arises, what chance was there of a fatal termination being averted.